This article continues from the theoretical discussions here, here, and here. 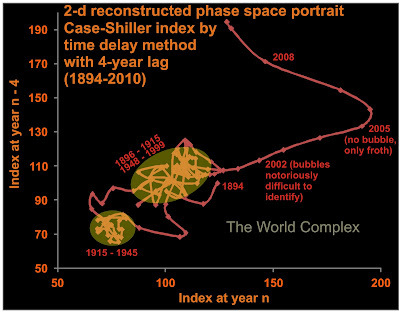 Today we begin looking at some reconstructed phase space portraits (in two dimensions). These are all figures that have been shown here. All three of today's examples show multistable behaviour. As discussed last time, the implication of multistability is that there are two (or more) equilibrium states in the system, as opposed to just one (the most common assumption). Stability arises from negative feedback. The instability results from positive feedback. Complex adaptive systems with many participants commonly exhibit both and are thus prone to multistability. The Case-Shiller index is an inflation-adjusted measure of house prices (for houses of constant quality) in the United States. The reconstructed phase space (above) shows two areas of Lyapunov stability. The tick marks on the trajectory mark the states at one-year intervals. As the lag is four years, the first point on the graph is the plot of the 1890 value against the 1894 value. The point is labelled as representing the state in 1894--consequently the 1894 state is the first one that can be plotted despite available observations going back to 1890. The larger of the two areas of stability is occupied over two long stretches totalling nearly 70 years. The smaller of the two areas is occupied for 30 years. Thus of the 116 states (at one-year intervals), 100 of them occur in one of these two areas of stability. There are two short transitions, in about 1915, where inflation-adjusted housing prices suddenly fell, and again at about 1945, when they rose. 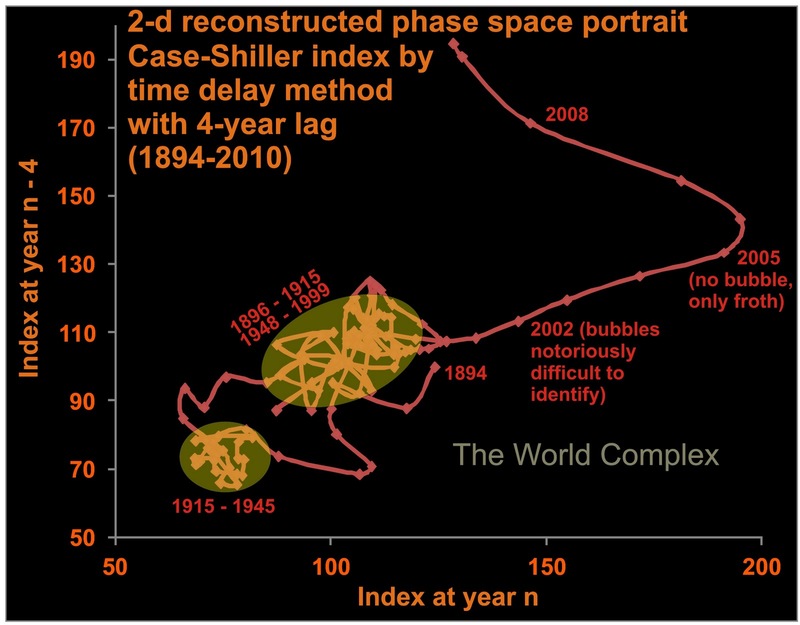 The principal era of instability began in the year 2000, whereupon the system embarked on an impressive excursion through phase space. Had this excursion wound up in another area of stability (this may yet be the hope of Greenspan, Bernanke, et al.) we would not be discussing a housing bubble now, but rather a new paradigm of high house prices. Unfortunately, there is no evidence of any stability--and for topological reasons, it is impossible for the current position in phase space to be an area of stability. If housing prices were to remain at today's levels (adjusted for inflation), the trajectory of the curve would evolve directly towards a point just to the NE of the tip of the large area of stability--at about (130, 130). It would arrive there in four years. If prices continue to fall, then the trajectory may fall into either the larger area of stability, or perhaps even the smaller one. Either outcome is more likely than developing a new area of stability at prices equal to or higher than today's prices. (FYI this does not constitute real-estate investment advice). As for the drop in housing prices after 1915--there are a few possible explanations for that, but the easy one might be the introduction of income tax (about the same time as the Federal Reserve), which would have reduced the money most people had available for such a purpose. Our normal expectation when less money is available for discretionary purchases is that prices will fall. There followed a long period where for various reasons there just wasn't much money--the Depression, and WWII. Interestingly, one reason there wasn't a lot of money available for buying houses despite scads of it being printed and distributed during WWII was the sale of War Bonds, which helped to draw excess money out of the economy and so prevent inflation. Curtailing this program at the end of WWII allowed inflation of house prices after 1945. Two areas of stability over the past ten years--one of low unemployment, and more recently, a stable area of high unemployment. The plot of unemployment vs interest rate also shows two distinct areas of stability in phase space. The existence of (at least) two areas of stability points to (at least) two equilibria in the system of unemployment and interest rates. This is at odds with the assumption of single equilibrium in the system which has informed the Central Bank's policy of lowering interest rates in order to stimulate employment. 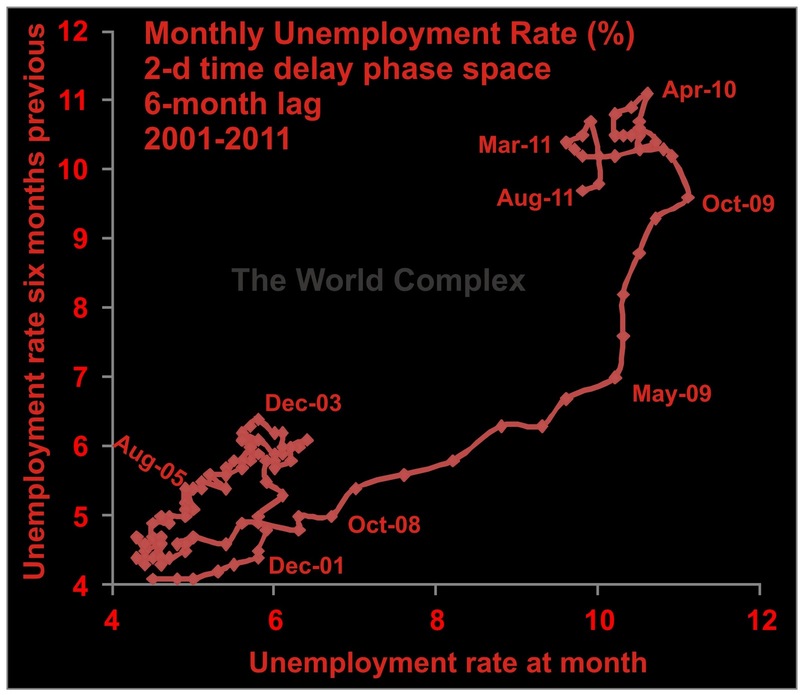 A major problem with the relationship between interest rates and unemployment--like economic theory in general, this relationship is simply asserted. A great amount of effort has gone into justifying these assertions--and to be fair, the assertion doesn't seem unreasonable. However economic theory seems to assume that the preferences of the various participants in the system will never change in a way that has not been foreseen by an economist. For instance, suppose that interest rates are high, around 10%. At such high rates, you had better be borrowing money for some productive purpose or the interest will kill you. Such high rates will make it difficult for a business founded on debt to succeed as interest on the entire debt has to be paid out of the profits. It is easy to see here that any marginal decline in interest rates will increase the likelihood of success of any business. More successful businesses mean more jobs. So lower those rates! But economists don't consider that if interest rates fall below some level, some participants will see that is easier to try to make a living on speculation rather than productive industry. If real interest rates fall to zero, and you have an unlimited ability to borrow, then why not speculate on, say, the stock market. You just keep borrowing and gambling until you win big, and as interest rates are so low you can easily carry the debt until you win. It's a lot easier than building a factory to make refrigerators. The lower the interest rate falls, the greater the impetus to speculate rather than produce, as the costs of carrying the debt are minimal. 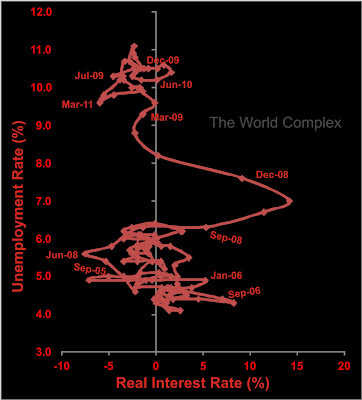 In this scenario, lowering interest rates no longer creates employment, as it simply encourages more speculation. No doubt, there will be a few hardy fools out there trying to start a business, but they are a distinct minority. The empirical evidence suggests the policy of lowering interest rates to stimulate employment has failed. Unfortunately, because our observations are at odds with classical economic theory, it is unlikely we will see any change in Central Bank policy. I think the only option is higher interest rates, but this will only be possible after the debt that is currently choking the system is somehow purged. Canadian Mint launches new gold "ETR"